Spaceliner chief of Virgin Galactic, Richard Branson, wraps himself in confidence that the WhiteKnightTwo mothership and SpaceShipTwo will bring about the era of public space travel. Full-scale WhiteKnightTwo is being readied for July rollout at Scaled Composites facilities in Mojave, California. NEW YORK —Two space tourism firms hoping to give fare-paying customers the rides of theirlives are set to take some major steps forward in coming months. On July 28,the suborbital tourism firm Virgin Galactic will unveil the firstWhiteKnightTwo mothership for its planned fleet of SpaceShipTwospaceliners designed by aerospace veteran Burt Rutan and his company ScaledComposites. Meanwhile, the Virginia-based company Space Adventures is preparingto launch its sixth paying customer on a $30 million trek to the InternationalSpace Station on Oct.12, with two more orbital hopefuls already waiting in thewings. First up isVirgin Galactic, a firm founded by British entrepreneur Sir Richard Bransonwith the aim of launching up to six paying customers and two pilots on joyrides to suborbital space for about $200,000 a seat. At the coreof VirginGalactic?s reusable spaceliner fleet is SpaceShipTwo, an air-launched suborbitalspacecraft derived from Rutan?s $10 million Ansari X Prize-winning SpaceShipOnedesign. Virgin Galactic has ordered five SpaceShipTwos and two of their immenseWhiteKnightTwomotherships, the first of which has been christened ?Eve? after Branson?smother and will be unveiled at a Scaled hangar at the Mojave Air and Space Portin Mojave, Calif.
?We?ll berolling this carrier out of the hangar for the first time on July 28, andshortly afterward it will start its test program," Virgin Galacticcommercial director Stephen Attenborough said Wednesday during the 2008 SpaceBusiness Forum held here by the non-profit Space Foundation. ?It will be theworld?s largest all carbon composite aircraft?it breaks all sorts of records.? With aunique dual-boom design, Rutan?s WhiteKnightTwo sports a wingspan of about 140feet (42 meters) with each outboard cabin mounted about 25 feet (7.6 meters)from its centrally moored SpaceShipTwo payload. About 254 people have paid atotal of about $36 million in down payments to assure their SpaceShipTwo seatsonce the spacecraft begins operational flights. 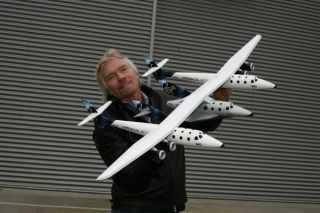 The suborbital vehicle itselfis slated to be unveiled early next year, Virgin Galactic officials have said. The carriercraft is also designed with the capability to haul unmanned rockets in place ofa crew-carrying vehicle, and could one day be used to launch low Earth orbitingsatellites or even cargo into space, Attenborough said. With its 18-inch(46-cm) windows and roomy 7.5-foot (2.2-meter) wide cabin, SpaceShipTwo could also be used for suborbital science experiments in addition to leisuretrips, he added. ?We built abig spaceship,? Attenborough said. ?It?s going to have plenty of room in there for thescientists and the experiments they?re going to do in there.? Later thisyear, Space Adventures plans to launch Americanmillionaire Richard Garriott, the son of retired NASA astronaut OwenGarriott, to the International Space Station under a $30 million agreement withRussia?s Federal Space Agency. Garriott isset to launch Oct. 12 aboard a Russian Soyuz spacecraft with the spacestation?s Expedition 18 commander Michael Fincke of NASA and flight engineerYuri Lonchakov of Russia?s Federal Space Agency. Garriott isthe sixth space tourist to hitch a ride to the station with Space Adventures,which has been the only firm to offer multimillion-dollar treks to orbit since thelandmark flight of American entrepreneur Dennis Tito in 2001. Last week, SpaceAdventures announced its intent to launch thefirst all-private Soyuz flight to the space station in 2011 and welcomedGoogle co-founder Sergey Brin to its ranks of hopeful private spaceflyers. ?We are acompany that is amazingly now 10 years old,? said Eric Anderson, Space Adventurespresident and CEO, during the forum, adding that there are a host ofopportunities still ahead for his firm. ?We?re sort of at a crux and lookingahead toward the next 10 years, so anything is possible.? In additionto Garriott, Space Adventures has contracts for two more orbital tourists — theseventh and eighth private spaceflyers — though their identities haveyet to be publicly revealed, Anderson told SPACE.com. GeorgeNield, the associate administrator of the Office of Commerical Spaceflight atthe Federal Aviation Administration, said the strides by Virgin Galactic, SpaceAdventures and others are just the beginning of a potential watershed for thespace tourism industry. ?Today,spaceflight as we?ve known it for the last half century is at the doorway tochange,? Nield said during the forum. ?We?re on the threshold of seeing what wethink will be a very significant market on suborbital flights for space tourism.? Ambitiouscommercial endeavors, he added, are also taking on a larger role in the U.S.spaceflight industry that was traditionally reserved for government agencies inthe past. ?This isnot your father?s version of the U.S. space program,? Nield said. ?The futureof space belongs to private enterprise. ?